General manager Mike Maccagnan has been impressed by Sam Darnold's progress as the rookie quarterback appears on course to win the starting job for the New York Jets. 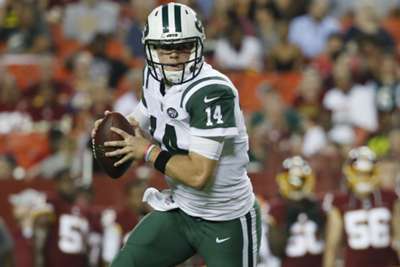 Darnold has demonstrated why the Jets moved up to grab him with the third pick in this year's draft during preseason, completing 21 of his 29 pass attempts for 158 yards and one touchdown. While he has also thrown an interception during his two appearances, Maccagnan praised the 21-year-old for the way he's adapted quickly to life in the NFL. "They've thrown everything at him, in terms of the offense," Maccagnan said in an interview with WFAN. "He's handled it, he's moved on, and he's done well with it. But every day he goes out there, he gets a little better." With Darnold emerging at the head of the quarterback queue, the Jets face a decision over the futures of Josh McCown and Teddy Bridgewater. Maccagnan revealed he is open to trading either, though he did not rule out keeping all three on the roster for the start of the regular season. "There's nothing to stop us from keeping three (quarterbacks). There's nothing to stop us from keeping two," he said. "You have to look at what you think is in the best interest of the organisation. You really have to operate at 35,000-foot level because you're making decisions that's trying to set the team up for success not only immediately but also down the road." The Jets face the New York Giants next before wrapping up their preseason campaign against the Philadelphia Eagles on August 31. Pakistan's squad for the Cricket World Cup does not include Mohammad Amir, but Mohammad Hafeez should be fit to feature.